Post The Patch Type Crest Being Worn. Apples and oranges, and still not a DI. Not only were these popular w/ 79th Div folks, the 2nd Div had many an enameled Indian on a white star worn on their fouragerres. They aren't DIs, either. 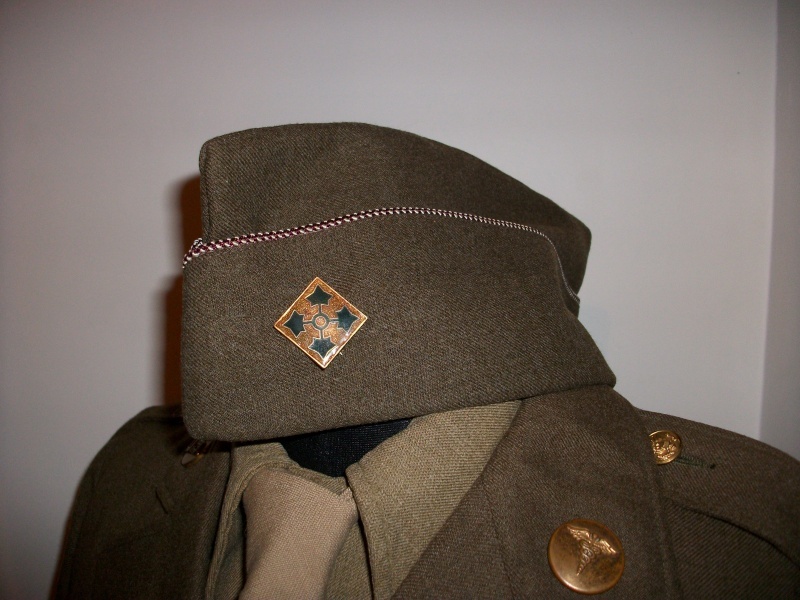 During WWI, and later, the chief authorized insignia to denote regimental affiliation was the collar disk. I give up. Can we agree it's a cool looking pin, and it looks good on the guys headgear. 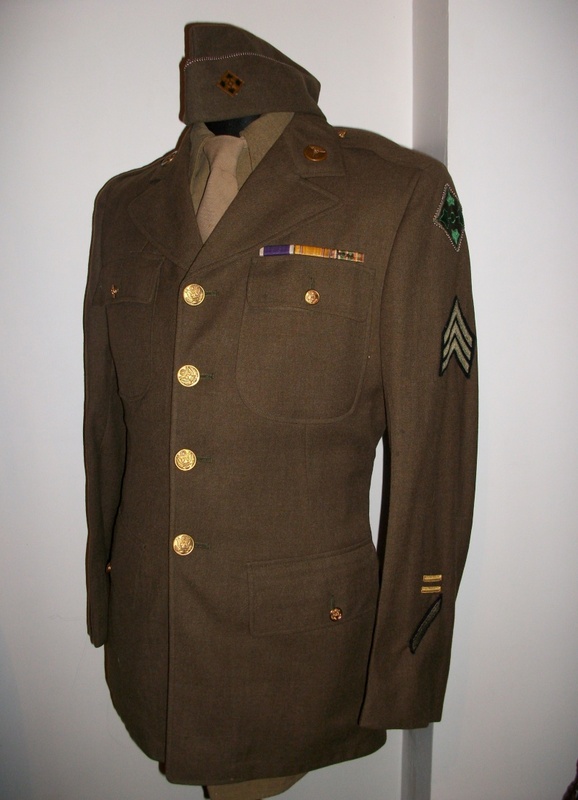 A 3rd Div PTC, on a Musician Sergeant. Note the Musician pre war type chevrons, like the Air Corps types. IKE as we see has it's discs and French Rope, but is missing it's other insignia wise, IE ribbons, marksmanship badge if there was one, other DI's or perhaps other 3rd Div PTCs, but cool to see the PTC remains on the cap. Edited by patches, 28 July 2018 - 08:04 PM. Edited by tredhed2, 12 September 2018 - 09:19 AM. I think it just needs polishing. An early 60s Lt Col of the Combat Development Command, wearing a Combat Development Command PTC (photo posted by seanmc1114 in the Patches in Action topic). Looks like a 24th Div combat patch there, Korea no doubt. Edited by patches, 17 September 2018 - 07:30 PM. A 511th PIR Ike with 11th Abn Div PTC that was sold long time ago and is now on Worthpoint. 2nd Armored Division patch type crests worn by Medal of Honor recipient Sgt. Hulon Brocke Whittington of Company I 41st Armored Infantry Regiment. Note he is not wearing collar discs. Born near Bogalusa, Louisiana, July 9, 1921, he earned the Medal of Honor in World War II while serving as Sergeant, 41st Armored Infantry, 2 Armored Division, near Grimesnil, France, July 29, 1944. He later served as the model for "G.I. Joe: American Legion Soldier," a thirteen-foot limestone statue located at 1608 K Street in Washington, D.C. He died on January 17, 1969 and was buried in Section 8 of Arlington National Cemetery. Entered service at: Bastrop, Louisiana. Born: 9 July 1921, Bogalusa, Louisiana. G.O. No. : 32, 23 April 1945. For conspicuous gallantry and intrepidity at the risk of life above and beyond the call of duty. On the night of 29 July 1944, near Grimesnil, France, during an enemy armored attack, Sgt. Whittington, a squad leader, assumed command of his platoon when the platoon leader and platoon sergeant became missing in action. He reorganized the defense and, under fire, courageously crawled between gun positions to check the actions of his men. When the advancing enemy attempted to penetrate a roadblock, Sgt. Whittington, completely disregarding intense enemy action, mounted a tank and by shouting through the turret, directed it into position to fire pointblank at the leading Mark V German tank. The destruction of this vehicle blocked all movement of the remaining enemy column consisting of over 100 vehicles of a Panzer unit. The blocked vehicles were then destroyed by handgrenades, bazooka, tank, and artillery fire and large numbers of enemy personnel were wiped out by a bold and resolute bayonet charge inspired by Sgt. Whittington. When the medical aid man had become a casualty, Sgt. Whittington personally administered first aid to his wounded men. The dynamic leadership, the inspiring example, and the dauntless courage of Sgt. Whittington, above and beyond the call of duty, are in keeping with the highest traditions of the military service. Whittington became a commissioned officer in 1949 and reached the rank of major in 1960. While serving in Vietnam as an ARVN ordnance advisor, he suffered a heart attack, forcing him to retire. He died at age 47 and was buried in Arlington National Cemetery, Arlington County, Virginia. Great color photo, can't stop thinking how odd it is though as to him not wearing collar discs right, that and he's wearing the 2nd Armd Div crests as the 41st Infantry had a DI, had one since 1933. Edited by patches, 29 October 2018 - 07:25 PM. One more Air Transport Command PTC sighting here on the Overseas Cap, maybe stateside or overseas in 45. Here is my addition to this topic. Edited by ghost, 18 December 2018 - 04:21 AM. And a great TWOfer, a couple, husband and wife? they are both wearing the Air Transport Command PTC (photo posted by jguy in the WWII Couples topic, and posted here with his kind consent). Just found this, one Jane Ross, once again we see the Army Air Corp's Air Transportation Command PTC. Ross was a women of note. A Maj Roy J. Herte Jr in 1965 with the Indianhead Division PTC.